Alarmtech offers camera systems that provide High Definition image quality to give your home or business the video detail it needs to stay safe and secure. Our camera systems are easy to use yet robust enough to grow to suit your future needs. As an exacqVision Select Reseller Alarmtech has experience in the installation of systems that exceed 200 cameras. We take that experience in larger systems and apply it to smaller home and businesses. IP based video technology has advanced the security camera industry by leaps and bounds. Gone are the days of low quality, grainy Analog video. Today, a single HD camera can produce better video than multiple traditional Analog cameras could ever provide. Our in house staff have the Networking Knowledge to take full advantage of the advancements provided by IP video. Card access systems provide many improvements to traditional, lock and key, physical security systems. Imagine eliminating the time consuming task of providing keys to all employees. As well as eliminating the security threat that comes from lost or misplaced keys. 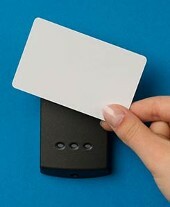 With a card access system, the flip of a switch can grant or restrict an individual's access to areas of your business. Alarmtech provides card access systems that are easy for your personnel to use and maintain. Our products and experience gives you the peace of mind that your property is secure & your employees are accounted for.